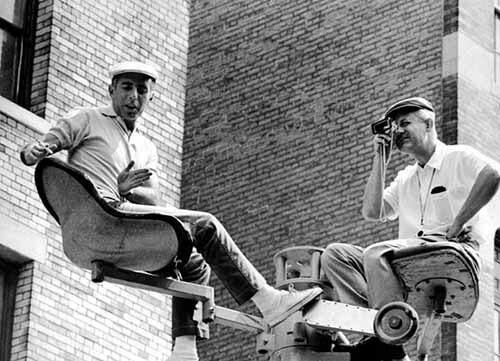 Few artists in the history of the medium have mastered their craft so well as has filmmaker Robert Wise. The four-time Oscar winner (well, five actually, if you count the Irving G. Thalberg Memorial Award he received in 1967) is responsible for many of the finest films ever captured on celluloid. Before stepping into the role of director, Wise served as editor on such landmark films as The Hunchback of Notre Dame (1939), Citizen Kane (1941), and The Magnificent Ambersons (1942), on which he also worked as uncredited co-director. While most filmmakers have one specific strength, the versatile Wise has moved from genre to genre with ease. In a career spanning an unbelievable eight decades, nearly everything Wise has touched has turned to gold. He has fashioned classic films in nearly every genre (and in some cases the definitive example of that field): horror (The Haunting, 1963), science fiction (The Day the Earth Stood Still, 1951), drama (Somebody Up There Likes Me, 1956), spectacle (Helen of Troy, 1956), musical (West Side Story, 1961, and The Sound of Music, 1965), action (Run Silent, Run Deep, 1958), western (Blood on the Moon, 1948), and the list goes on. When the American Film Institute composed their list of the 100 greatest films in the history of American cinema in 1998, both West Side Story and The Sound of Music made the cut, with Citizen Kane occupying the top spot. While the likes of D. W. Griffith, King Vidor, John Ford, and Wise’s mentor Orson Welles suffered from age discrimination and eventually found themselves unable to work, the remarkable Wise directed his 40th film, A Storm in Summer (2000), at the age of 85. Making this feat even more incredible, the film, which Wise made for Showtime, was nominated for three Emmys. In addition, the screenplay, penned by the late Rod Serling, received a Writers Guild Award. When I sat down to talk with 87-year-old Wise, a living legend if ever there was one, I was unsure what I would find. Would this be a sickly old man, living his final days dishing up anecdotes about ancient successes, or would he be the Robert Wise of old, somehow impervious to the foils of Father Time? After talking with the legendary filmmaker, I can honestly report that time has shown little effect on him. While he believes A Storm in Summer is likely his final film, Robert Wise shows no signs of slowing down any time soon. Director Budd Boetticher once suggested to me that Orson Welles might possibly be the most overrated filmmaker in history. Having worked with Welles, what are your thoughts on this observation? I don’t think that’s so. I worked with the man. I edited his first two films, Citizen Kane and The Magnificent Ambersons, and I think he was absolutely brilliant. For me, the fact that he was only 25 years old when he made Citizen Kane, which has been called the greatest film ever made – to me, that justifies his praise and testifies to his talent. Welles left for Rio before postproduction was completed on The Magnificent Ambersons. The members of the Mercury Theatre group and yourself were left to complete the film. Tell me a little bit about that. He had to go to Rio, and we were left to finish editing the film. You see, with Citizen Kane, we hadn’t screened it for a test audience. But the studio decided they wanted to have a test screening for The Magnificent Ambersons, and it was a disaster. The audience didn’t like it at all, and they laughed at a lot of it at inappropriate times. A lot of the audience walked out. It was just terrible. And this was a very long film, so we decided to take it back and do some editing and try to cut out some of the places where the laughs were bad. We did that, and then we took it out again for another screening. This time things were a little better, but there were still some bad laughs, so we had to cut it again. We cut it three times. Finally, we had cut so much that there was a continuity problem, so we had to add a scene with Georgie and his mother. Since Orson wasn’t around, I was asked to direct that scene. I did, and we added that to the film. When we screened it the fourth time, there were no walk-outs and no bad laughs. Everything seemed to play all right, so that’s the way the picture went out. Welles had a well-documented resentment toward the film because of the alterations the studio ordered. Did Welles ever direct any of that resentment toward you? I don’t think so. I think he understood that I was the editor and I was working under the studio’s direction. I was working with Jack Moss, who was Orson’s man on the picture. So I don’t think Orson had any resentment toward us. I think he understood that we were just doing what we had to do. In his essay, “The Day the Earth Stood Still: Dramatizing a Political Tract,” film analyst James Shaw asserts that producer Julian Blaustein, screenwriter Edmund North, and yourself, all of whom he calls New Deal Democrats, “sought to impart a rational response to the McCarthy era following World War II,” thus making what he felt was a political statement. Do you agree with this, or is it a case of overanalysis? I think overanalysis. [Laughs.] I don’t think there’s anything to that. Does it ever amuse you when scholars search for subtext that perhaps doesn’t exist? Oh, sure. [Laughs.] You know, the interesting thing about The Day the Earth Stood Still was the casting. Originally, Julian Blaustein, Eddie North, and I had envisioned Claude Rains for the lead role in The Day the Earth Stood Still. Fortunately for us, as it turned out, he was unavailable; he was performing in a play in New York. I got a call from Darryl Zanuck, who was running the studio, and he said, “I just signed a talented young actor that I’d like you to consider for the lead role in your picture.” So I met Michael Rennie, I liked him, and I cast him. That turned out to be a big break for us. Instead of having an actor who had done other films and who people had seen before, we had a brand-new fresh-faced actor to do the film. I actually think the film had much more credibility with Michael than it might have had with Claude Rains. I recall reading that you had problems with the War Department regarding the film’s theme of peace. Is that correct? Yeah. For some reason or another, we needed some tanks for the film. When we sent the script over to the War Department, they didn’t like it! [Laughs.] They didn’t like the peace message in it, and they refused to let us use the tanks. Luckily, someone suggested that we request the tanks from the National Guard in Virginia. We went over and spoke with them about it, and they had no problems with it. So all the tanks which appear in the picture were from the National Guard in Virginia. In 1956, you directed the Rocky Graziano biopic, Somebody Up There Likes Me. Was it a daunting task to make a film about the life of someone who was still very much alive? Well, it was all right. Paul Newman and I spent time with him in New York. We studied him: the way he spoke, the way he walked. . . We met some of his friends and spoke with them. We got to know him pretty well. Then we were able to get ahold of an interview with Rocky that was on tape, so Paul could listen to it, and study the way Rocky spoke. Before his untimely death, actor James Dean was slated to play Graziano in that picture. How do you think the film might have been different with Dean in the leading role? Oh, I have no idea. I really can’t say, but I think Paul Newman did an excellent job. He’s really quite good in that picture. You co-directed West Side Story with Jerome Robbins. Since you had already directed 27 films prior to that, and Robbins had already worked extensively in theatre, were there any disagreements regarding a difference in vision? Actually, it was a pretty smooth collaboration. Jerry decided that unless he could do more than simply repeat his work as choreographer from the stage play, then he’d rather not work on the film. I was a producer, as well as the director, and I decided the best thing for the film would be to have Jerry onboard as a co-director. I thought, he could do the musical and dance parts of the film, and I could do the book part. That worked quite well for about 60 percent of the shooting. Then we began running behind schedule, and the studio decided to take Robbins off the film. Fortunately for me, he had rehearsed all the remaining dance numbers, and all of his staff stayed on to assist me, and I was able to continue and finish the show. What are your thoughts on Jan De Bont’s remake of your film The Haunting? I didn’t see it, but I hear it was terrible. I’ve had many people tell me over the years, “Mr. Wise, you made the scariest film I’ve ever seen, and you don’t show anything. How did you do it?” It’s all by suggestion, where, in the remake, I’ve been told that everything is shown. I cannot imagine how this could be as effective. You once called The Sand Pebbles the most difficult film you ever made. What were some of the challenges you faced working on that film? The big obstacle was working on a boat, and filming on water. I’d never done that before. That was something I found quite difficult. Also, we had problems with showing the Yangtze River because we weren’t allowed into China at that time. We were forced to shoot outside Hong Kong, which has no river. But there were places where they had little juts of land and islands, and I was able to place my camera in such a way that it looked like the Yangtze River. But those were the challenges. What was Steve McQueen like to work with? Steve was fine. A great guy. No problem at all. He did a great job in the film, and received his only Academy Award nomination. He didn’t win, but he was nominated. Let’s talk about another musical you directed, The Sound of Music. At one time that film was the biggest money-maker of all time. Does the continued success of that film ever amaze you? We took the film out for a couple of advance screenings in the Midwest. We took it to Chicago one night and to Minneapolis the next. Once we got the audience reaction and saw the preview cards, which were sensational, we were sure we were going to have a very successful picture, but we had no idea it was gonna go through the roof like it did. Three years after The Sound of Music, you collaborated with Julie Andrews for another musical, Star! . Although Star! received seven Oscar nominations, it didn’t receive the accolades The Sound of Music had, nor was it a box-office success. What was your reaction to that? Well, it was very disappointing. I think Star! is an awfully good picture, but for some reason it just didn’t catch on. It was a biographical film about Gertrude Lawrence. I think it’s a damned good picture, but it just didn’t seem to work for the audiences . . . or the critics, I’m afraid. That film was later rereleased in a substantially shorter version titled Those Were the Happy Times. What was your involvement with this second version? I had no involvement at all. The studio said they wanted to try to do something with it, so I turned it over to the studio and let them make the changes. I took my name off of it. They cut it with my film editor, but again, I had no involvement. I didn’t like the version they made, either. In 1996, you made your debut as an actor in John Landis’ aptly titled film The Stupids. How on earth did you become involved with this project? The film industry is a place where age discrimination is practiced routinely, yet you directed your 40th film, A Storm in Summer, at the age of 85. What’s your secret? Well, I don’t know if there’s any secret, but I was thrilled by the offer to make this film. I love directing films. It’s been my whole life, so when they came to me with the script and told me that Peter Falk was attached, I liked the idea and I said, ‘Sure, I’d like very much to make this film.” The film turned out quite good, I thought, and was nominated for three Emmys. I was quite pleased with A Storm in Summer. It was my 40th film, and it will be my last. Andrew J. Rausch is a freelance film writer whose work has appeared in numerous publications including Shock Cinema, Images, The Joe Bob Briggs Report, Film Threat, and Ain't It Cool News. Rausch is also the author of the forthcoming Citadel book, The 100 Greatest American Films.